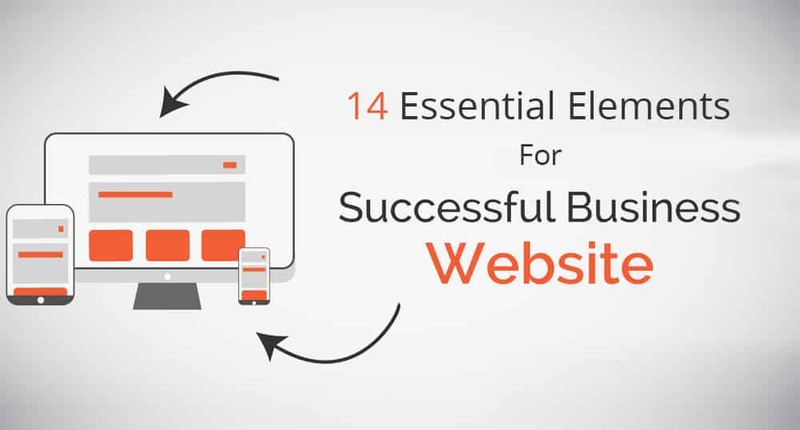 Essential Elements for Successful Business Website: As the title suggest, in this post we are going to discuss about essential elements required for a successful online website. Gone are the days when even having a website with simple business description was enough. In the new era of internet business you need to have a perfect website or you will be out of the game. Website designing is moving towards a future that reflects effective designing without having to toil in changing pages for information. It is all about the need for people to follow trends in web designing and becoming a part of the growth process. As the change is inevitable, technical world is also accustomed to alterations in terms of designing. However, the challenge to having a business website is not only about building a 7-8 page’s website but it’s got everything to do with doing the whole deal right. One usually ends up asking a decent web design firm to do the job, the trick lies in making it unique, making it informative and making it braced with all the competent aspects to not only drive visitors but drive business from the same. This write-up briefs about few essentials that usual business websites miss and don’t include in their online agenda, but the same can escalate their online presence to newer heights. Top web design service provider suggest covering all these elements in a business website. The social media crazy world out there is looking for your business on these ‘in’ platforms. A majority of educated and informed audience is present on networking websites like Facebook, Twitter, LinkedIn etc. It makes a lot sense to have a social networking integration mechanism in place on your website so that a visitor to your site is able to broadcast information from your business website to his friends or followers. Professional web design firm suggest that business websites must integrate social networking onto their website especially for areas like news, press releases, photo galleries etc. Newsletters are a great way to stay in touch with prospects, interested groups and individuals. They typically carry news, updates, and promotional messages to propagate content to subscribers. By having a newsletter subscription mechanism in place, a visitor who is interested in your company or getting updates from you can enlist himself in the mailing list. Several seo services india companies offer added services like email marketing to target your mailing list based on a wide range of criteria. Web Syndication enables visitors to extract information from a website to the program of their choice, without visiting your website. These feeds are accessed through RSS Readers, or e-mailers. Companies must consult their website development companies about RSS or Atom syndication for their business websites. Generally, top website design companies include this as an integral feature of their services. The quest of building USP and repute company websites is addressed by seasoned website development companies. The need of having ‘technically correct’ website in terms of right sitemap, xml structure, SEO etc. is addressed by professional companies that are equipped with seasoned staff and technological support to give professional websites an edge above others. The stages of brand awareness, perception and involvement were majorly dominated by the brand managers. However today, the world is a very different place. Today’s consumer is evolved, informed and empowered with smart phone devices, ubiquitous internet access and social networks to discuss and hence influence brand experience. Times are changing faster and the market trends are evolving rapidly. Here, we have listed several relevant trends in the virtual world for merchandisers and marketers to consider as they gear up to plan for the next campaign for their eCommerce store. a. The soaring adoption and consumer acceptance at a never-before pace – Today’s consumers are extremely flexible and open to new ideas and technologies. Inventions are latching on and talking off at unprecedented speed, thus thinning the line between change “inventors” and “early followers”. b. The shift from traditional shopping channels to eCommerce and mCommerce has been really fast – While in the year 2009, worldwide online sales were estimated around $8 trillion, the same is estimated to double the size by 2013. On the similar path, while the mobile commerce market – mCommerce was $42 billion in the previous year (2010), it is projected to touch the whopping figure of $70 billion by the end of coming few years. c. Increasing cross-channel consumers’ spend – Studies reveal that nearly every internet user in the age of 16-55 has purchased goods on the Internet. Due to the fact that people seems to have less time for shopping nowadays compared to earlier generations, the demand for convenience and information search before making a purchase has increased. The benefits offered with multiple channels are that customers can search for information in one channel and pursue the purchase transaction stage in another channel. Hence, it is in every brand’s best interest to cater to this highly profitable cross-channel consumer segment. d. Increased consumer interaction with brands – Though the consumer always had the opportunity to decide for the fate of a brand but blog postings, online feedback, ratings and other consumer forums empower them further to influence brand perception more visibly. Consumers’ negative reviews are significantly affecting brand status and because of this shift, producers, retailers and marketers are being extra conscious with content and promotions that consumers will find relevant and trustworthy. The best way to do that is engage them, reward them and convert them into loyal brand advocates. e. Marketing shift from selling to interacting – Historically, marketing initiatives were driven to push products, bring in sales and create brand awareness as a whole. The customer was being targeted on the basis of per-defined criteria as derived from previous behavior patterns and historical purchase behaviors. However, these strategies are not applicable today. Today’s consumer demands real time, experience based marketing. Strategies like loyal consumer cards coupled with location based services make it possible to offer consumers different sort of offers on a real-time as they walk down a store’s aisle or enter a mall premises. Consumers can respond to these direct messages through store walk-ins or by availing special packages.